In this blog post, we will be looking at 11 of the best leaflet design tips to get you more business and catch the eye of your potential customers. If you are considering a leaflet drop campaign to promote your business or service, one of the most exciting, yet stressful, parts in the actual design of your leaflet. Chances are you have been playing around with a few designs to see what works best for your business, and probably toying with images and logos to make that all so important good first impression. Our advice to you; stop what you are doing and read this guide as that perfect flyer is something few of us can get right the first time without professional guidance. There are more things to consider when it comes to designing your leaflet than you will probably have thought of. The biggest mistake people make is creating a flyer that appeals to you personally. For a truly successful leaflet design, you need to step out of the box and think of the impact it is having on others when it hits their doormat. You only have that one chance to grab their attention, and here are some leaflet design tips for you on how to do it. A creative brief is to a leaflet or brochure design what a business plan is to a new company. In other words, you won’t get far without one. Don’t be disheartened by this, it is merely common sense. To start with you need to determine the best size of leaflet to get your message across. You want it small enough so it can be delivered in pristine condition but not so small that you have such a small font to get all your info on that people have to squint to read it. Having a look at the leaflets that come through your own door will help you greatly. The second part of your brief is to consider what you want to achieve with your leaflet, in other words, what is the point of it. Promoting a service you offer will require a completely different leaflet design to one promoting a retail outlet and the products it sells. Now think about who your leaflet is aimed at. Age and gender both fall into this category, so think about who you are trying to appeal to. Finally, consider what you want the recipient of your leaflet to do next, what is your main call to action? When you have answered all these questions you will already have a better idea of the text content, imagery and overall design you are looking for to yield the results you are seeking. In the marketing world, AIDA is not an opera by Puccini, it is a commonly used acronym used to describe a list of common events that anyone engaging in a marketing campaign should employ. It stands for Attention, Interest, Desire, and Action. 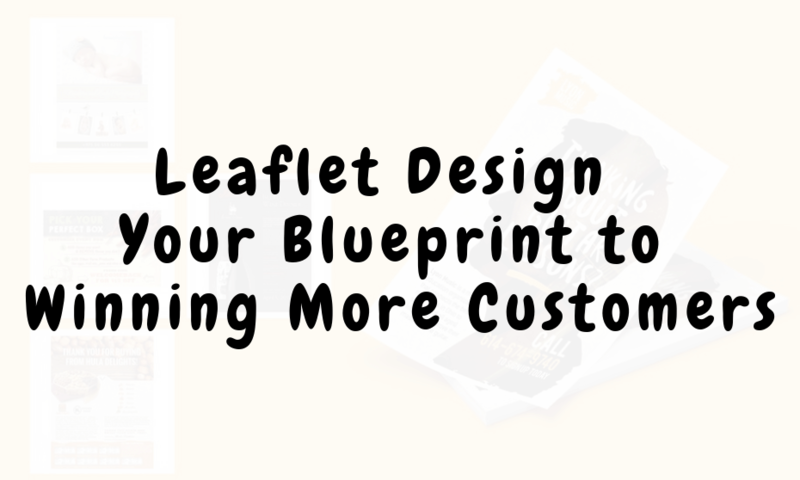 It is particularly prevalent when it comes to leaflet design as all four areas are covered in this task and this an important part of our leaflet design tips we would you to use. Attention; Attracting the attention of your potential customers by being aware of what will appeal to them. Interest; Capturing your target audience’s interest in what you are selling or offering from the moment they pick up your flyer. Holding their interest with relevant information and eye-catching images. Desire; Convincing your audience through your leaflet design that you are offering what they want, even though they may not know it yet. Action; Leading your audience to take action, be it pick up the phone to call you or visit your premises. Now you can see why the AIDA formula is used so much in marketing and advertising campaigns, it literally covers all bases in one fell swoop. One thing you have to bear in mind from the outset is that today’s consumer is being bombarded with marketing info in the form of leaflets as well as banner ads of various kinds. Even though the other flyers delivered will probably not be offering the same products or services as they still have to be classed as competition. Chances are your flyer will not drop through a door by itself, meaning that it has to stand out in a crowd and make the right impression instantly. Time dominates today’s world, and you may have as little 2 seconds to make this first impression positive and capture the attention of the recipient. There is an old saying that you never get a second chance to make that first impression, and this could have been invented for flyers. The two main factors in making your own first impression are the quality of the design and the attention-grabbing headline. Combine these two together and you have the best possible chance of success, and this is how to do it. In this section of our leaflet design tips, we will look at the quality of your leaflet design. The quality of a flyer design isn’t limited to how it looks, it is also how it feels. A prospective customer will view your leaflet as an indication of the quality of the product or service you are offering. Your flyer has to appeal to several of the senses, and if just one is a let down it affects the others. That leaflet is the only way of portraying the quality of your business to your target audience. A flyer that looks cheap and unprofessional will give the instant impression that your business/service/product is unprofessional, and that good first impression you were hoping for is straight out the window. Think of your habits when you pick up flyers from your front door. You will more than likely throw the cheap and nasty one straight in the bin without even looking at them, but if you feel one that is a thicker, better quality one you will read it. The visual impact is huge, and even if you are a fast food fan, how many times have you instantly condemned a leaflet to the bin that has large, garish coloured lettering and big, out of focus shots of kebabs or chicken that are clearly years old. Many businesses see this approach as cheap and cheerful, then blame everyone but themselves for the failure of their door drop campaign. They will spend little time over the design, cramming as much into a small space as possible, thus rendering it impossible to read. What many they have saved will be eaten up by the distribution costs which will yield such a poor result that they end up out of pocket. No campaign should result in this, but a scarily high percentage are due entirely to their poor flyer design. The cost of having a high impact, professional looking leaflet should be seen as an investment. With all the best intentions in the world, designing your leaflet online and employing the colours and images you want will have no bearing on the finished product once it is printed. Listen to whoever you have chosen to print your leaflets. They are not going to lie to you as they will want your return business, and taking their advice on board can make the difference between a successful leaflet design and one dropped straight in the aforementioned bin. #5 – Content That Is Both Interesting And Engaging. No leaflet design tips guide would be complete without looking at the content on your flyer. As well as the overall appearance of your leaflet design, it also needs substance. This achieved through clever use of text and images, and you should choose the ones that best match the objectives of your flyer as well as appealing to your target audience. #6 – The Text Of Your Leaflet. 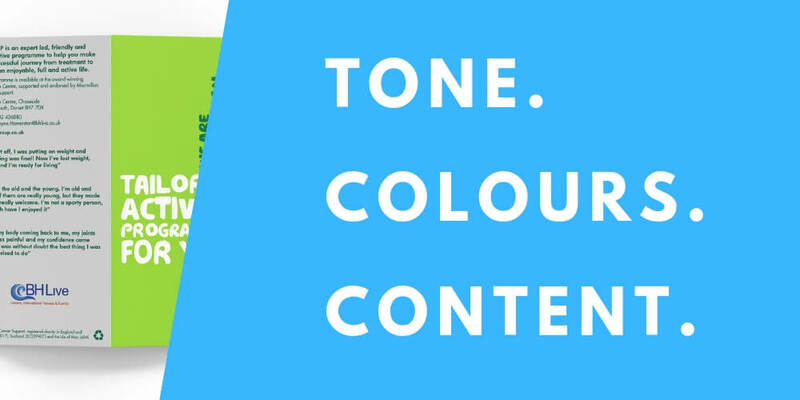 You may be sick of hearing this by now but you have to choose text that will interest your audience. You have to get across the value of what you are offering them and really sell why it is so good. People want to know why they should go with you as opposed to somebody else. Less in definitely more when it comes to the text included within your leaflet design. A flyer that has too much info packed into it is instantly unappealing. You want to get your message across in a sharp and succinct way, convey it in a way that has clarity, brevity, and immediacy. Do not have a copy that is bulked into long paragraphs. Make short and sharp statements. Use bold headings and bullet points to highlight important information. A little imagination on the linguistic side can go a long way to selling something. Tips include describing somewhere small as cosy and intimate or if you are offering a one-off promotion tell them this is their one and only chance to take advantage of this offer. If you are advertising food take inspiration from the great food writers and describe them as mouthwatering or scrumptious. Get the picture? #7 – The Imagery On Your Leaflet. One of the most agreed upon when we were doing our research for this leaflet design tips guide, was the imagery. If a picture really does paint a thousand words then where better to use them than as part of your flyer design? There is no better way to promote your business or service than by using images on your flyers. As we have already covered the fact we do not want to bombard anyone with too much text, an image can tell them everything they need to know. Do not resort to old images off the Internet, people aren’t stupid, and if you are promoting the products you are selling through your leaflet then they will expect that image to be yours. If you have a decent camera then, by all means, take your own shots, but ensure they are true to life. Professional looking images break up text and are aesthetically pleasing as well as being instantly recognisable, enabling the customer to associate the image with what you are trying to promote. Stick to images relevant to what you are promoting at the time, not random pictures where the customer has to search for the link. #8 – Quality Of Imagery On Your Leaflet. Although we touched on it above, you really cannot risk adding shoddy images to your flyer. To print off successfully and look as true to life as possible they must be taken with a quality camera. Professional images will always show off your products or services to their full potential. To put this into context, once again look to other leaflets for inspiration or think of the wonderful images that make us book our holidays. Think professional at all times and be honest with yourself, if you are not up to the job get a professional photographer to take some pictures for you, and think of it as an investment, not just another expense. #9 – Calling Your Customers To Action. Another well-used marketing term, a call to action is how a recipient will take further action in response to seeing your leaflet. Every flyer needs a call to action as this is the whole point of the leaflet. The linchpin of a successful flyer is its call to action and this involves the drawing together of all the best practices including the creativity of the visual design and the power of the text. A call to action with a leaflet is usually at the most basic level, so don’t fret to much about it as it is very easy to implement through just a few tips. Clear listing of your contact details is a must. This could be your address, phone number, website URL or a combination of all of them. If you have an online presence in social media, for example, a page on Facebook or a Twitter address, get those on there too. The object of this is making it as easy as possible for them to contact you or find out more about you, and by including all this info you are doing exactly that. As we mentioned in the text brief earlier, evocative text can make a huge difference and using before you contact details can have a huge impact. For example, a one-off special event that has to be pre-booked should have your phone number or email address immediately following the text telling them this is there one chance to enjoy it. A limited time offer with this leaflet can also be used in this way. These are simple but hugely effective calls to action, and by following this easy guide you are giving yourself the best chance of them acting on it. #10 – Proof, Proof, and Proof Again! Nothing smacks of unprofessionalism more than spelling mistakes and poor grammar. Proofing anything that is going out to the public should not have to spell out, and however great the design of your leaflet that spelling mistake will stand out like a sore thumb, see what we mean? It can be hard to proof your own work as you read what you are expecting to be there, so get a third party to look over it for you. Your printer will not proof text but will advise on images, as low-resolution images often pixelate when reproduced. #11 – Paper and Printing. Once you have followed all our tips and your leaflet design is proofed, and the images have the thumbs up, you would be forgiven for thinking that is job done. Not so, as now you have to decide on the finish you want and the paper to use. Will your design look better with a glossy or matt finish? Does it matter to you whether your leaflet is floppy or rigid? These need thinking about carefully. Your printer should advise you on the finish and it may come down to cost when determining the thickness of the paper. A standard run of leaflets is 5000, there is going to be a significant weight difference depending on the paper. Speak to both your printer and your leaflet distributor what they advise in terms of paper. There are many paper thicknesses available so, between you and your team, you should be able to come to a decision about which looks the best and how heavy it will be for the distributor. There is a lot of information above, so here is a brief overview of what we have covered to save you going back and forwards through the guide. Make sure you have a good creative brief in place before you start and answer the questions from the viewpoint of the householder who is receiving your leaflet. Be professional at all times. Make sure your flyer design is modern, is relevant to the product or service you are promoting. Ensure your text is short and snappy. Don’t try and cram too many words into one small space and this renders your leaflet unreadable to many. Any images should be top quality and high resolution. Old and shoddy images will spoil the whole look of your leaflet and ruin that first impression. Make sure your call to action is punchy, and include all contact details and addresses of any online presence. Go for quality every time. Your leaflet must appeal to the reader and cheap and cheerful is simply not good enough. Liaise with your printer and distributor. They are highly experienced and on your side, take advantage of the knowledge they are sharing with you as you should be working together as a team to get the best results from your leaflet campaign. We hope you enjoyed reading this our leaflet design tips article and it benefits your business. If you need help with leaflet design, we have a good team of experienced and creative designers who will work with you to create a quality design that attracts attention and generates leads so dont hesitate to get in touch.